Want a Lush Lawn? Time to Fertilize! It’s that time of spring when your lawn needs to feed! One of the big reasons lawns and plant in landscapes go into decline is that they don’t get fertilized on schedule. If the soil has been neglected, then plants can go into starvation mode even faster. Now that warm season grasses have come out of dormancy and are actively growing, they need a boost of nutrients. If you’re a DIYer, be sure to buy a quality organic fertilzer and apply now or over the next few weeks. If you’re on our Soil Building Program, we’ll be applying our own special mixture of dry organic fertilizers to your lawn now through May. 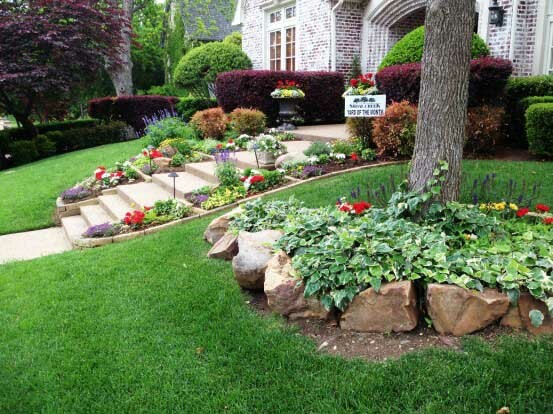 We’ve spent years perfecting the best blend of organic nutrients to feed your soil, lawn and landscape. We’re often asked by our customers if their mowing or watering schedule needs to be changed to accomodate our applications. The great thing about our organic products is that they won’t burn your plants and they don’t have to be watered in right away. Our liquid foliar feeds are absorbed through the foliage within only a few hours. So you don’t need to do a thing; just sit back and let us do the work!